Late evening attempt - one of many reasons why I hate bank holidays. Despite pre-checking the pub's website, Facebook and Twitter there was no pre-warning it had closed at 10.30 instead of 11.30. Evening visit until midnight close. Good chat with a ticker who had done pretty much every pub on the railway line between Walton-on-the-Naze and Colchester earlier in the day and then had more in London before finishing here. Dedication! Dark Star - Hophead (some, if not most, also brewed by Fuller's) 3.80 Not Tried Bar staff insisted all Hophead is brewed at Partridge Green still! Anspach & Hobday - The Irish Red (collaboration with Wicklow Wolf) 4.00 Not Tried All collaborations really annoy me as it is never stated who did what where. Did one brewer just spit in the brew to give it its bit of provenance? Late evening visit thwarted by lights off and no sign of life, as with other pubs locally, allegedly due to a massive Sunderland AFC crowd taking over Trafalgar Square. Certainly lots of chanting and litter, all nearby. Late evening visit until 11.30pm close. A mish-mash of missed trains made for a short visit, too late to sample the SPBW inspired cask ale from the wood which had run out. Thursday evening in this superb and very popular pub, even busier than usual tonight as there was a large group of SPBW members present for the unveiling of a plaque in memory of the late Bill English. In spite of being very busy service was almost immediate. Only once did I have to ask for a top up and this was given with good grace. XT Brewing - Animal Brewing Lion London Porter 4.60 On gravity dispense from a wooden cask on the bar, superb. 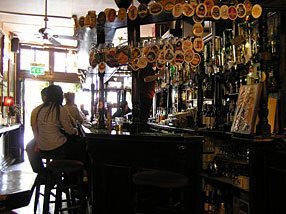 The pub is found in Charing Cross, Central London, WC2N 4HS. 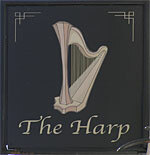 Formerly the Welsh Harp, a small narrow long pub on Chandos Place, just a stone's throw from Charing Cross railway station, so very handy for commuters. Hanging baskets at the front are attractive. A steep flight of stairs leads to the toilets and an upstairs room. There is an alley at the rear for smokers. 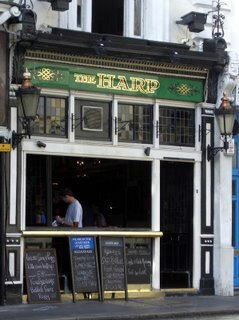 Won the ultimate accolade as CAMRA National Pub of the Year in 2010. In 2011 CAMRA London Cider Pub of the Year, in 2012 CAMRA West London branch Pub of the Year, and again in 2014 as joint branch Pub of the Year and in 2016 and then 2018 as branch Pub of the Year once more. Previously privately owned it was sold to Fuller's in mid July 2014 for a reported £7 million so changes expected. Closed for some days in February 2015 for an upgrade to plumbing and electrics, in particular to swap over the Gents and Ladies toilets. Good range of regional and micro breweries beer available through 10 handpumps and a superb range of ciders and perries sold from boxes in the chilled cabinets behind the bar. 10% price discount for card carrying CAMRA members on cask ales. We have visited this pub 475 times, seen 947 different beers and tried 398 of them.